James Perrin was born in Corpus Christi, Texas, on October 19, 1974. He attended college on a full-ride scholarship for basketball. While in law school, James established a sports agency and represented professional basketball and football players. James later founded The Law Offices of James F. Perrin where he personally handled a wide range of cases. He would then go on to join forces with the Wyatt Law Firm, Ltd. in 2002 and would remain with that firm for over 14 years. In August of 2016 James moved to Lubbock, Texas where he would form James F. Perrin, PLLC and would become a partner at Fargason, Booth, St. Clair Richards and Wilkins, LLP (FBSR&W). Though James' primary office and home are in Lubbock, he continues his longstanding relationship with the Wyatt Law Firm by serving as "Of Counsel" to the firm. James continues to work with the Wyatt Law Firm on serious injury and death cases in West Texas and throughout the state of Texas. 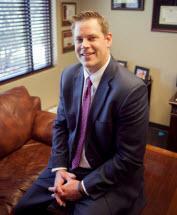 James Perrin has concentrated his practice on handling personal injury and wrongful death claims. He has had success in handling a wide variety of cases including: truck crashes, house fires, carbon monoxide poisoning, electrocutions, workplace negligence, oil field accidents, defective fans and heaters, defective tires, helicopter crashes and plane crashes. As a skilled Texas personal injury attorney with almost 20 years of legal experience, Mr. Perrin has seen first-hand just how devastating an accident can be on an individual or family. Whether an accident has been caused by a serious lack of safety protocols in the workplace or due to a negligent truck driver or trucking company, James Perrin has devoted his practice to seeking justice for those that he represents. He is truly dedicated to helping people who have been innocently injured or wrongfully killed due to the negligence of others. Due to his extensive experience, Attorney Perrin is ready and equipped to handle all types of complex legal matters involving the death of a loved one or a serious injury. Legal Education: Doctor of Jurisprudence, Texas Tech University (2000). Undergraduate: B.S. Business -Marketing, Southern Nazarene University (1997). Texas Trial Lawyers Association, Association of Trial Lawyers of America, South Plains Trial Lawyers Association, The National Trial Lawyers - Top 100, The National Trial Lawyers Trucking - Top 10, The Top 25 Brain Injury Trial Lawyers Association, American Institute of Personal Injury Attorneys - 10 Best Client Satisfaction 2017 and 2018.